Notably thin soils mean Vers Cras can suffer in hot years like 2015, but performs brilliantly in cooler years like ’16. Its citrus nose and taut, mineral palate are hugely appealing, while a dose of 20% new oak adds a seductive buttery note to the long finish. The wine Domaine des Gerbeaux is owned and run by wife/husband team of Beatrice (who heralds from nearby Chaintre) and Jean-Michel Drouin, who since 1979 has developed the domaine originated by his grandfather in 1896. They have now been joined by their son Xavier. Jean-Michel produces some of the best and most distinctive wines in the Mâconnais region. In typically Burgundian style, he has small parcels of vines (over 40) spread around in Mâcon, St. Véran and Pouilly-Fuissé. The wines are fermented in stainless steel tanks, enamel vats (to maxmise the contact with the lees) or wooden barrels depending on their nature. The wines are superb and Jean-Michel is in the envious position of knowing that every bottle is sold before it is bottled. 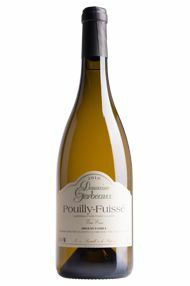 In particular, his Pouilly-Fuissé Vieilles Vignes is outstanding, with richness, finesse and perfect integration between fruit and oak. 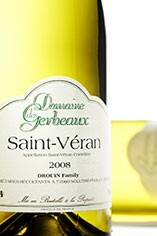 The St Véran wine comes from the village of Davayé, from a vineyard immediately adjacent to Pouilly Fuissé. Berry Bros & Rudd take the entire crop of this cuvee every year. Pouilly-Fuissé is the most distinguished wine appellation in the Mâconnais, making rich, full-bodied white Burgundy from Chardonnay in four communes: Chaintré, Fuissé, Solutré-Pouilly and Vergisson. There is a move afoot to consider classifying individual vineyard sites. Since arriving in the Mâconnais in 1987, Olivier and Corinne Merlin have become among the region’s most respected producers. After 10 years, they began buying Pouilly-Fuissé grapes, and now make three different cuvées each vintage. Pouilly-Fuissé should not be confused with Pouilly-Fumé or Pouilly-sur-Loire in the Loire Valley that produce wines from Sauvignon Blanc.